Rebecca Black has a dark past. She has lived many lives, from working for the Department of Child Welfare to teaching as an adjunct professor. She is a survivor and BRCA1 previvor. She has also died–three times. In the midst of it all, she has found a physical connection and a spiritual purpose with a family of elephants. Rebecca was born in Michigan but grew up in Tucson, Arizona, where she lives today with her husband, two sons, and two dogs. She loves art–especially Gustav Klimt. She adores music–Tori Amos, Otis Redding, and Radiohead. She is an eclectic, fierce woman. Alicia Bonner Ness inspires mission-driven leaders and organizations to engage for change. She is a community organizer, brand strategist, and event producer passionate about helping people find common cause. After more than a decade working in the social sector, she founded Heptagon Productions, a brand activation agency through which she serves mission-driven organizations in civic engagement, democracy reform, and social justice. 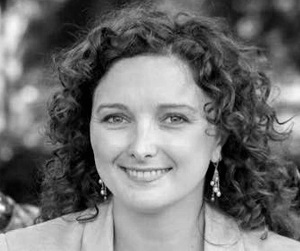 A LUMA Institute certified human-centered design facilitator, she uses a unique blend of open ideation and design activation to help individuals and organizations uncover their shared conviction to pursue their higher purpose. Educated at Johns Hopkins University, Barnard College, and Miss Hall's School, she learned her most important life lessons before the age of 10. She lives in Brooklyn, NY with her husband. Click here for Alicia’s website. Cord A. Scott is an Associate Professor for the University of Maryland system currently residing in Korea. His publication work includes several topics on aspects of Chicago history, aspects of popular culture in American media as well as American military culture, and aspects of comic books. His book Comics and Conflict was published in 2014. Currently he is working on cartoons produced in Stars and Stripes during World War I.
Kari Wiseman was born in South Dakota and slowly migrated south to Atlanta, Georgia. She is a stay-at-home mom with her husband of 26 years and their 2 children. You can usually find her hiking, playing games with her kids, and carrying her camera around while searching for unusual moments or angles that catch her eye. Kari’s unique perspective due to a complicated personal life has inspired many. She worked in the television industry for eleven years, was a granite sales consultant for homes and businesses, and was a Nurse Aide in a nursing home. Kari has had the privilege of sharing her story of adoption, finding family, abuse, and forgiveness with thousands of people. She also has a daily blog that integrates words of inspiration with her passion of photography.